The SL1000 is capable of transferring previous data sets/files while streaming is still in progress through the File Divide feature. When the SL1000 starts recording, it opens a new file and starts logging data. If the first file reaches the 2GB size limit, the SL1000 automatically creates a second file and begins logging data onto the second file. Files that have been automatically divided when a recording file size exceeds 2 GB cannot be transferred until the recording of all divided files is finished. To close the second file and open a new file, you will need to click on the Divide Recording button. The previous data sets (first and second file) will then be available for transfer onto the PC without interrupting the data logging process. 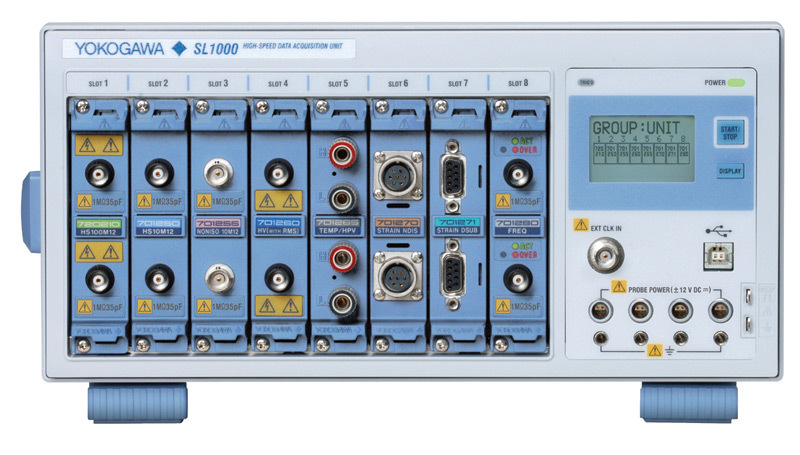 Transferring data does not cause any slowdown in data acquisition on the SL1000 and you do not need to stop data acquisition to transfer data. Click the Divide Recording button or choose Divide Recording from the Acquisition menu to save measured data being recorded to divided files. If you select Time, proceed to step 6. Otherwise, proceed to step 9. Set First Data to First Data, Timed (if Time was selected in step 5), or No. of Points (if No. of Points was selected in step 5). If you select First Data, proceed to step 8. If you select Timed of No. of Points, proceed to step 7. Set the file division start time (if Time was selected in step 5) or the number of points for dividing files (if No. of Points was selected in step 5). Set the record length unit to Day, Hour, Minute, or Second (if Time was selected in step 5) or Points (if No. of Points was selected in step 5). Then, set the record length. Click Browse and select the save destination, and then click OK.
Click Execute to divide the files. You cannot record to divided files during synchronous operation. You cannot download files that have been automatically divided when a recording file size exceeds 2 GB until the recording of all divided files is finished.